Remotely configure and manage any Windows 10 IoT Core device by using Windows PowerShell. PowerShell is a task-based command-line shell and scripting language, designed especially for system administration. Make sure to follow these steps to correctly configure your device running Windows 10 IoT Core to work well with Visual Studio 2017. To start a PowerShell session with your Windows 10 IoT Core device, you'll first need to create a trust relationship between your host PC and your device. 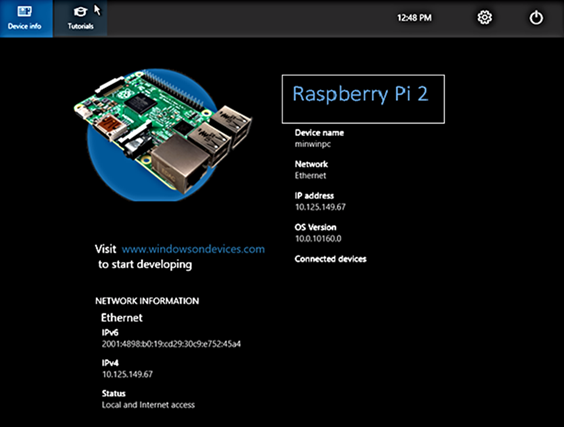 After starting your Windows IoT Core device, an IP address will be shown on the screen attached to the device. You can find the same information on the Windows 10 IoT Core Dashboard. Open an administrator PowerShell console on your local PC. 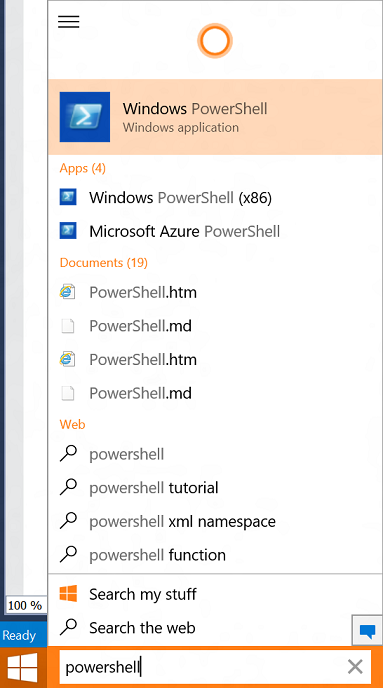 Type powershell in the Search the web and Windows box near the Windows Start menu. Windows will find PowerShell on your PC. 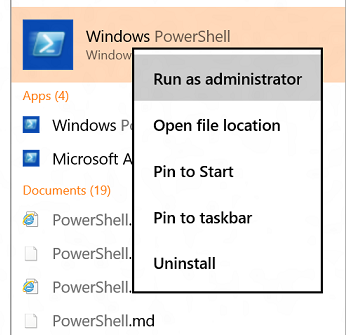 To start PowerShell as an administrator, right-click Windows PowerShell, and then select Run as administrator. Now you should see the PowerShell console. Enter Y to confirm the change. If you want to connect multiple devices, you can use commas and quotation marks to separate each device. Set-Item WSMan:\localhost\Client\TrustedHosts -Value "<machine1-name or IP Address>,<machine2-name or IP Address>"
The connection process is not immediate and can take up to 30 seconds. If you successfully connected to the device, you should see the IP address of your device before the prompt. b. Next, establish a new PowerShell session using Exit-PSSession and Enter-PSSession with the new credentials. To be able to deploy applications from Visual Studio 2017, you will need to make sure that the Visual Studio Remote Debugger is running on your Windows IoT Core device. The remote debugger should open automatically when you start your computer. To double check, use the tlist command to list all the running processes from PowerShell. There should be two instances of msvsmon.exe running on the device. It is possible for the Visual Studio Remote Debugger to time out after long periods of inactivity. If Visual Studio cannot connect to your Windows IoT Core device, try restarting the device. If you want, you can rename your device. Your Windows IoT Core device should now be properly configured and ready to use! For a list of commands and utilities that you can use with PowerShell, see the Command Line Utils page. Get-Command on a specified module returns an empty command list. Running a cmdlet from any of these modules throws CommandNotFoundException: Appx, NetAdapter, NetSecurity, NetTCPIP, PnpDevice. Import-Module on any of the above modules throws PSSecurityException exception with UnauthorizedAccess. Module auto loading does not seem to work either. Workaround: Modify the execution policy within the remote PowerShell session to RemoteSigned. For more details on the different execution policies, see Using the Set-ExecutionPolicy Cmdlet. ISSUE: Cmdlets from some modules such as NetAdapter are sometimes not visible. For example, Get-Module NetAdapter returns an empty list. Workaround: Use the -Force parameter with Import-Module. For example, Import-Module NetAdapter -Force. ISSUE: Setting execution policy to "AllSigned" breaks PowerShell remoting. Subsequent attempts to create a remote session fail with a SecurityException loading Typesv3.ps1xml. In PowerShell scripts, attributes to PowerShell class or enumeration do not work. Adding attributed results in the following exception thrown: Type must be a runtime Type object. Outbound CIM and PowerShell remoting is not supported. Relevant functionality in relying cmdlets will not work. These include Enter-PSSession, Get-Job, Receive-Job, Import-Module, Invoke-Command, and Copy-Item. SecureString commands ConvertFrom-SecureString and ConvertTo-SecureString do not work unless the session is created using CredSSP authentication. Otherwise, the -Key parameter must be specified. For details on configuring CredSSP authentication, see The “Double-Hop” Problem.